After getting caught with a suitcase of cocaine in November 2011, Karl Thorson was sentenced to 30 months in prison. From a penitentiary in California, he talks about finding fitness behind bars. “When released offenders feel isolated from the community and blocked from society’s opportunities and freedoms, they are more likely to return to a life of crime,” Rebecca Greenberg wrote in the sociology journal Verstehen. In Karl Thorson’s case, educating himself behind bars has been his priority. He can’t wait to become a free man again in February 2014. He’s already thinking about eating a good steak and drinking a cold beer, and he’s stoked to finally be able to get his hands on a pair of gymnastics rings and bumper plates. But more than anything, he’s eager to get involved with CrossFit for youth at risk. He can’t wait to use the knowledge he has gained in prison about strength and conditioning—and CrossFit specifically—to help others avoid the path he chose. For the most part, Thorson thinks the adjustment will be relatively fast and smooth. He has a supportive family and friends to turn to, and he has an education and employment plan. That said, Thorson knows there will be challenges. He knows there is a stigma, and he knows people don’t always embrace ex-prisoners. He is expecting people might judge him. Ultimately, Thorson knows some people won’t look past his mistakes. But he’s hoping some will. From felony drug dealer to youth counselor in 30 months because he swings a kettle bell....? Odd article tie in to crossfit. Just one example from Page 6 wonderfully tying the two together. avoid the path he chose." I hope this guy gets himself on a much better path when he gets out of prison. As the article states, having a strong community is a massive help to people in his situation. He will certainly find a supportive community at his local CrossFit affiliate. I have been really enjoying these articles. Thanks. That's what Crossfit is all about. Learning, changing, and become a better YOU. Share your story Homie and keep working on YOU. We are all a work in progress. Good luck. I recently got out of Federal Prison serving a 3 year bit. 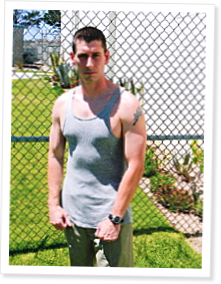 I actively did CrossFit in the 3 prisons I had been thru. I met some very seldom men that did it even met a guy who owned a CF affiliate, but it kept me focused out of trouble and giving something to the inmate population that wasn't so redundant for a change. I saw it change peoples lives like it has changed mine. I've been out for almost 3 months now. I've gotten Level 1 Certified, competed in my very first Boxtoberfest Games (Albuquerque NM) and a plethora of other things have happened in just this short 3 months. Needles to say if Karl can keep his momentum up.. the sky is the only limit.. my journey has barely begun and I literally hit the streets burning rubber. "Get up and don't give up"